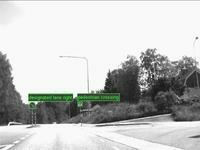 Sequences from highways and cities recorded from more that 350 km of Swedish roads . Movie showing some results from frame by frame detections obtained by Larsson et al. 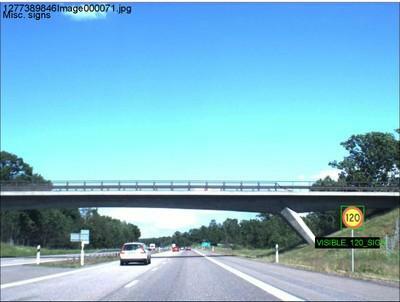 A dataset has been created by recording sequences from over 350 km of Swedish highways and city roads. 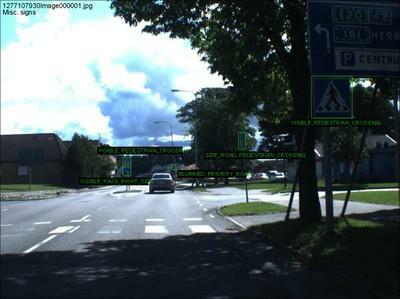 A 1.3 mega-pixel color camera, a Point-Grey Chameleon, was placed inside a car on the dashboard looking out of the front window. The camera was pointing slightly to the right, in order to cover as many relevant signs as possible. The lens had a focal length of 6.5mm, resulting in approximately 41 degrees field of view. 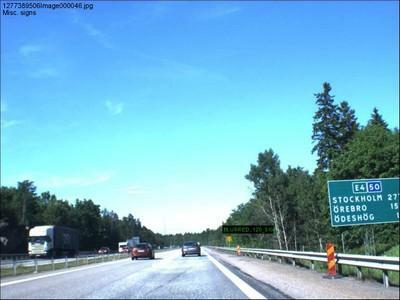 Typical speed signs on motorways are about 90 cm wide, which corresponds to a size of about 50 pixel if they are to be detected at a distance of about 30 m.
A human operator started the recording whenever a traffic sign was visible and stopped the recording when no more signs were visible. In total, in over 20 000 frames have been recorded of which every fifth frame has then been manually labeled. The label for each sign contains sign type (pedestrian crossing, designated lane right, no standing or parking, priority road, give way, 50 kph, or 30 kph), visibility status (occluded, blurred, or visible) and road status (whether the signs is on the road being traveled or on a side road), see below for examples. The entire database including ground truth is available here . 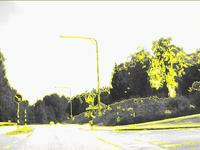 A movie showing some results from frame by frame detections obtained by Larsson et al., no temporal information taken into account The yellow lines depict the extracted contours. 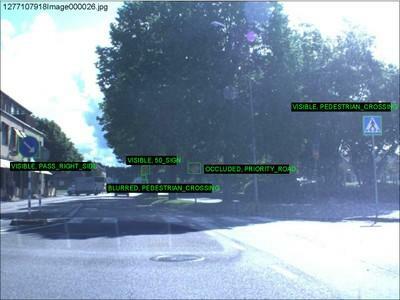 Green boxes show detected signs.